It’s a common notion to associated tattoos with large images like dragons, mythical creatures, and complex art. However, not many people appreciate the idea of covering their bodies with ink. But they’re for tattoo holds them back! What can be better than getting a tattoo that can effectively express their nature, without much effort and pain? Small sized tattoos! Tiny tattoos have now become extremely popular with the younger generation, particularly the celebrities, who get their visible body parts inked with small tattoo designs! From elements to nature to the initials of your loved ones, small tattoos have a plethora of designs to choose from. In this article, we have compiled the best of small tattoo ideas, which might be low on size, but are high on style! Small tattoos are perfect alternatives for people who love the idea of body art but do not want to overdo it. The advantage with smaller sized tattoos is that they don’t cost you a lot of money, effort, and pain, but the removal process is also easy. Also, small tattoos can be seamlessly converted into a whole new image, in case you want to reconsider your decision in the future. Some of the common tattoo motifs are flowers, leaves, rainbows, names, initials, stars, and other religious symbols. 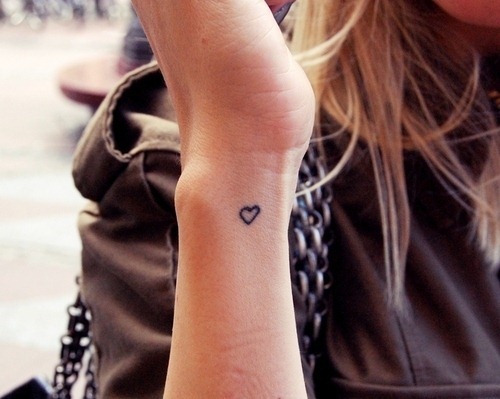 Small tattoos are one of the most elegant ways of speaking your heart out without having to paint a loud picture! 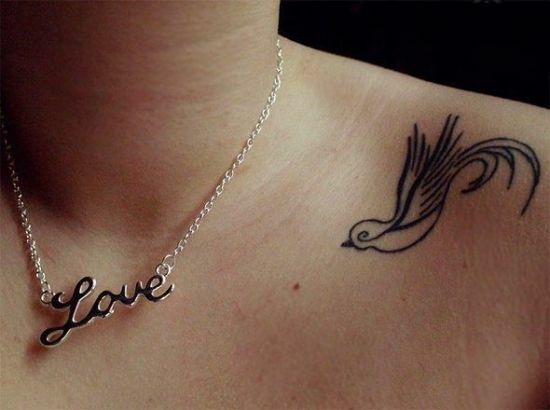 Read on to explore some of the cute small tattoo designs with meanings. Stars are the most common objects used in small tattoo designs. Sometimes people get three stars as in Orion’s belt or a single black star. 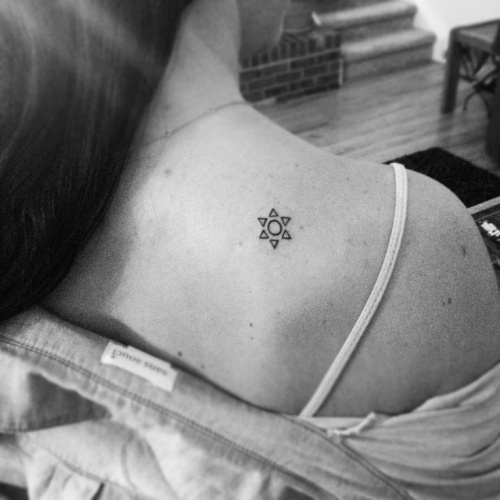 Star tattoos look best upon your shoulder blade or your wrist or ankle or even your back. You can either get a black outline or a black coloured star. 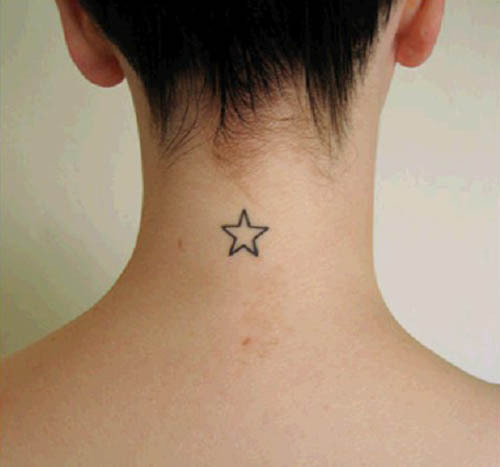 Best Suitable For: This small star tattoo is a unisex design and is best for people who wish to aim for the stars. It is also a reminder of their loved ones who passed away! 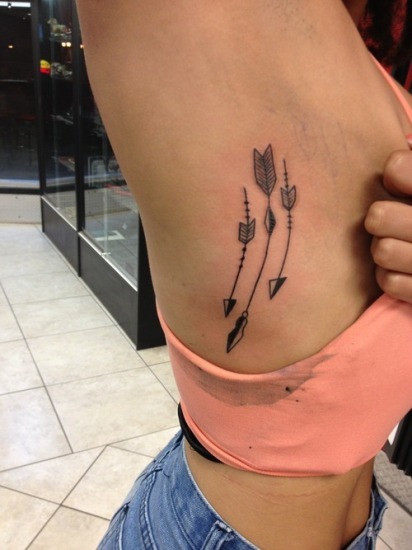 Arrow tattoos are chosen not just by archers but by other commoners too. Arrows like stars make for excellent tattoos and are thus opted for by many. 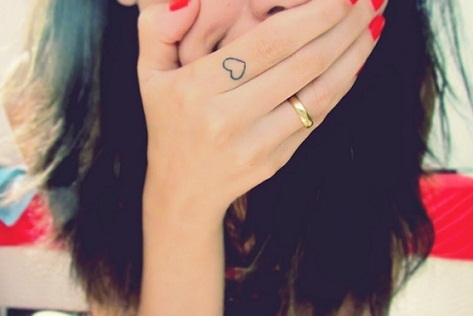 Sometimes small heart tattoos are added to give it the typical cupid look. You can add a bow to it to complete the entire look. You can make the arrow look archaic by adding carvings and other details or you could keep it simple and plain. Best Suitable For: The arrow tattoo is for both men and women who can aim sharp! 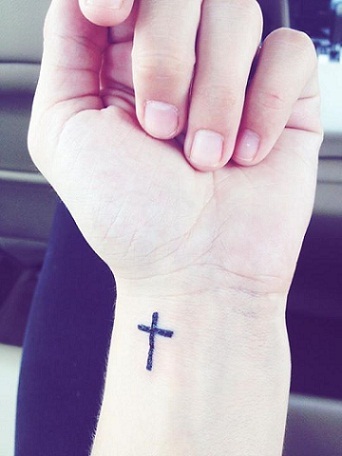 A small cross tattoo is another typical tattoo for there is no dearth of religious fanatics. Some people feel that having a cross tattooed on skin serves as excellent protection. Others take it as proof of their devotion to Christ. There are yet others who think it gives them a more elegant yet rebellious look. For the music lovers out there this is the perfect design. Most rock stars go for more colourful and vibrant tattoos that are large enough to cover their bodies. But for those who are shy and yet adamant on expressing their love for music, these tattoo designs are perfect. A small music notation on the inside of your wrist looks dainty and has a certain graceful air. Heart tattoos are also very commonplace. They are mostly opted for by girls and may or may not be coloured. They are no doubt feminine and pretty to look at. This kind of tattoo is mainly carried out by the girls who love to be inked but with a cute delicate tattoo which is not big. 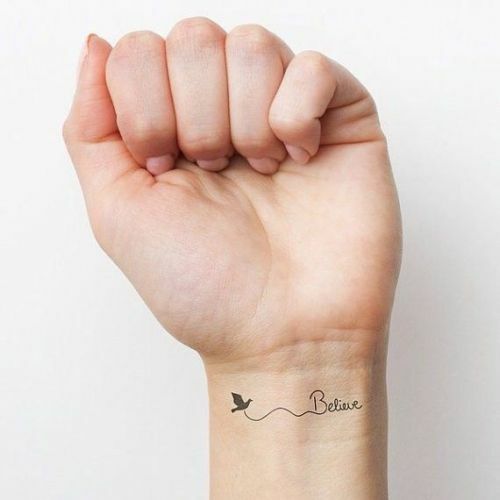 This small wrist tattoo can also be carried out on the neck, shoulders and the leg. The heart can be simply drawn by black ink or can be made coloured with different colors. The heart here symbolizes love. Best Suitable For: This little heart symbol is for women and girls who wish to declare their love without being too open about it! This design is elegant and beautiful. An image of birds in flight no matter how small always has a sense of liberation that makes your heart soar and says, ‘now that’s a pretty image!’. Blackbird silhouettes whether they are inked upon your wrist or ankle always manages to look good. Small anchors upon your wrist look excellent. They can be opted for by sailors, but that is not a necessity. 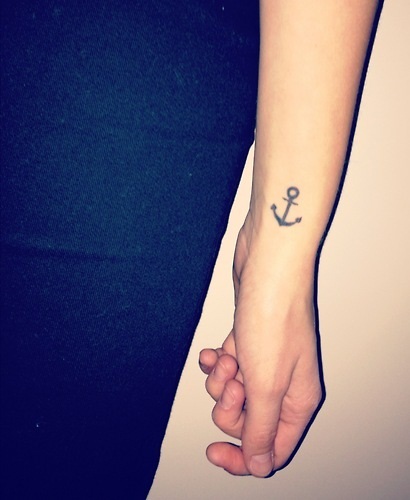 Anchors symbolize strong roots. They show represent stability and perseverance and are thus chosen by many, men and women alike. You can literally get them on any part of the body! 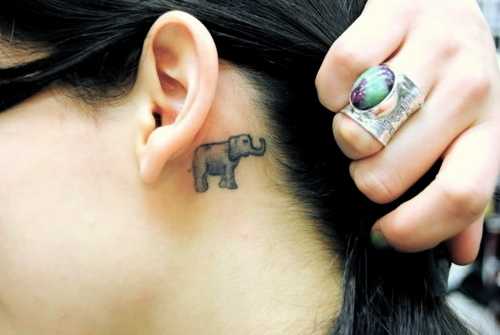 A small elephant tattoo can look extremely cute. An artistic elephant outline has a creative and elegant look that a huge realistic image doesn’t. Elephants as animals represent loyalty, strength and courage. Thus, your tattoo not only adds to your look but also gives the viewer a hint at your personality. Best Suitable For: This unique elephant tattoo is perfect for women and men who are independent, yet loyal. Strong, yet emotional! 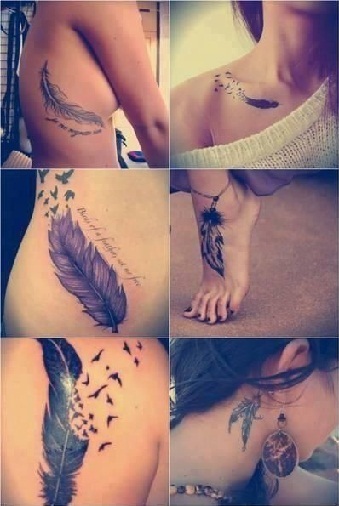 Small feathers look great inked upon parts of your body. Like birds, they represent a sense of freedom that is unparalleled. They look deeply meaningful and enigmatic. You can make it look artistic or realistic, either way, the tattoo looks great and can be hidden easily since its small. 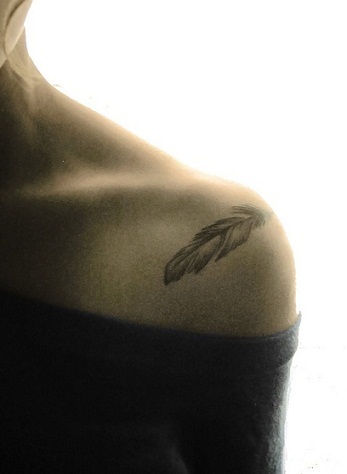 Best Suitable For: Feather tattoos are for both men and women who yearn for freedom! Preferable Ink: Depending on which bird’s feather is chosen, you can opt for colors like black, brown for your base. This can be an interesting design for those who are willing to have something very tiny to represent water symbols. 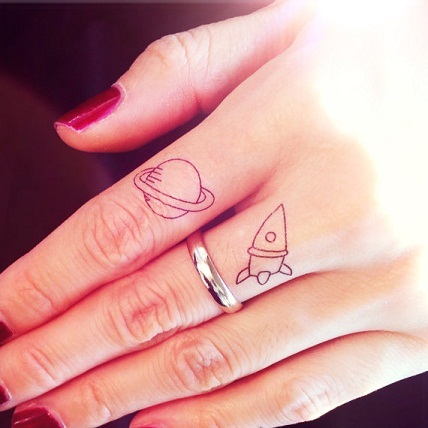 These can be done in small signs and you can have these on your fingers properly with some shading. These look like pencil drawings and have a very artistic edge to them. These are well placed and have some exciting patterns to them. 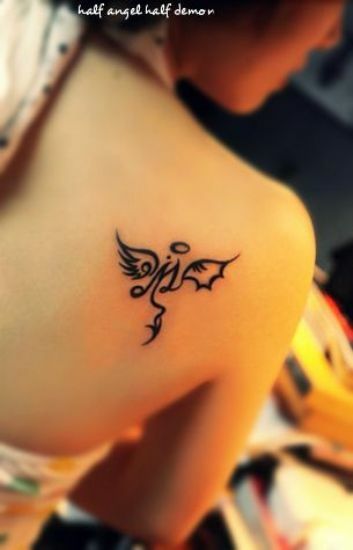 Angel tattoo designs are quite popular and you can have something like on your back which can make some heads turn. These can go proper with back open dresses. You can have some colours added and some shading. Some custom designs also work with these. If you are looking for some water type symbols then you can go for these. These look good whether done large or small and you can definitely something like this. You can have these as a small mark on your hand or anywhere you want and these can look much artistic. This is also one of the perfect small tattoo designs for men on hands. This is a very small wave style tattoo and you can have these done on chosen places. You can have these tattoos on the wrist which gives the impression of quite a girly style and these are small so you can easily hide these with makeup or when you turn to switch the position of your wrist. 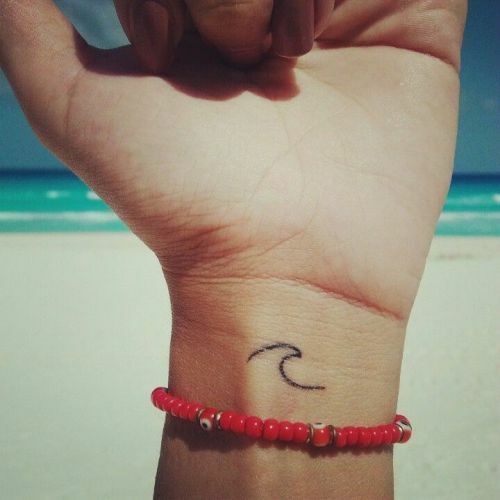 Best Suitable For: Small line tattoos as this wave tattoo is suitable for both men and women who wish to keep the memories of their beach vacation. This is a small directions pattern and often referred to as a compass box. You can try a similar style in color or shading and these cool quite cool. These are sporty and you can have these if you have a tomboyish personality. These look exciting too. 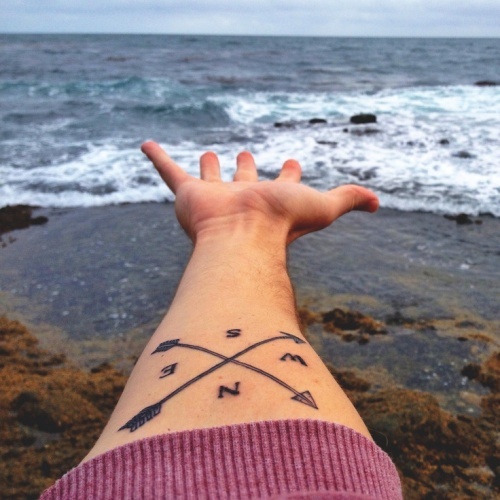 This compass tattoo is mainly carried out by the people who love travelling. It also symbolizes the people who are in the perfect direction in their lives. It can also be a small wrist tattoo for the woman. Different colours would add to the beauty of it, especially blue colour which would mean water. If you are willing to have an inking which is not similar to regular styles, you can have something like this. This is a weather symbol and has the directions marked on it. If you are going to have something like this, you can keep it small and it will only take about half to 2 square inches and your design should look proper to go with any types of outfits. This is a small horizontal design and you can do similar designs on your feet. These types of tattoo designs can be very artistic and represent types of emotions. You can make these cool with a fun element or you can make these alongside other associated designs. XO means kisses and hugs! This is a very small design and can look very cool for girls. You can sport these at a small place and you will not have to bother to hide it. If at all you want to hide it then just use some concealer and foundation to do so. These are artistic and look cool with any types of dress through which these can show. 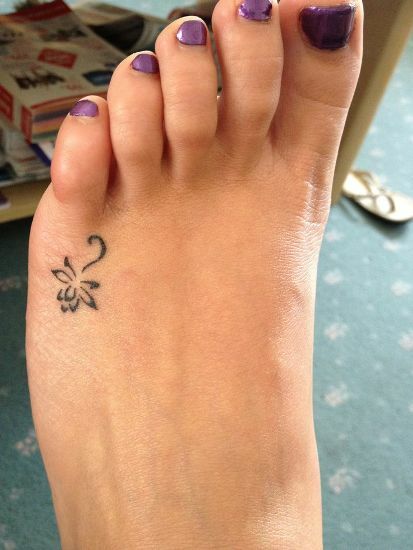 This is also one of the popular small tattoos for women and girls! Best Suitable For: Perfect for women who wish to give secret messages to their loved ones! 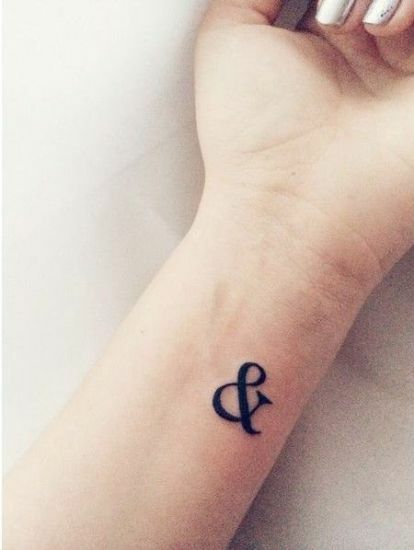 An Ampersand tattoo indicates that life is filled with great expectations and there is so much to do. You can try these in italics, bold and also hide these in times you do not want your design to get shown off. These are easy to hide with temporary makeup. You can even do these in white ink which can only be for your show and people will only see it when you point them out this. Best Suitable For: Suitable for both men and women who think they are not finished yet! You can make these cool with a geometric element or you can make these alongside other associated patterns, fonts or other markings. Instead of an animal, you can get similar styles for birds too. Depends on what you want and your artist can provide you with, you can choose a proper design for yourself. 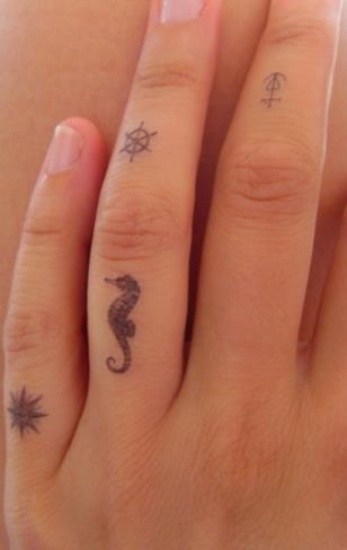 Most of the men like to flaunt this type of small tattoos on hands. These are very tiny symbols or designs and this is a flower which is very small. These are intricate, look very girly and if at all you are not comfortable with large designs then try something like this. 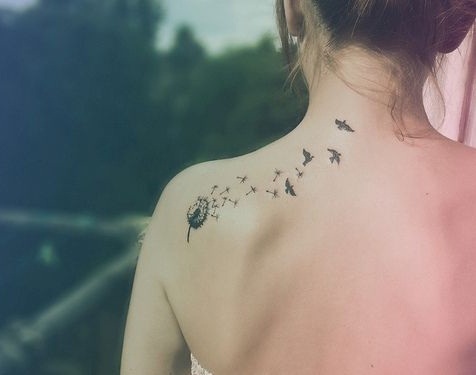 This small tattoo idea is suitable for women who love nature. The vine branches add to the beauty of the tattoo. The flower in the tattoo symbolizes peace, purity, and inspiration. Similarly, different flowers such as rose, marigold, sunflower etc along with leaves can be drawn on the neck, back, lower back and leg to get an eye-catchy look. A small heart can be quite a show if you do those on your fingers. These are very small and you will easily be even able to hide these with makeup. You can create similar styles on other parts of your body too. If you do not want to make large and head turning or excess of inking, then try out styles like this. This is one of the popular small tattoo designs for hands! Best Suitable For: This cute heart tattoo is unisex and is suitable for people in love! If you want some writing along the wrist line of hand to represent your beliefs you might try out these styles. These look cool and with birds’ effect, it enhances the whole pattern and you can also give these slight colours or keep these in black and white. You can have full silhouette black coloured birds or you can have them pencil drawn up to give these a 3D effect. Best Suitable For: This is one of the best designs for women to combine the theme of free-spiritedness of a bird with a word of inspiration. These are small arrow styles and you can do these on your underarm to hide these when you keep your arms down. However, you should properly choose these styles before deciding to do these on your hands. You can decide on the design before getting it done. You can also have these custom made to suit your needs. These can also have associated designs as in the roses. 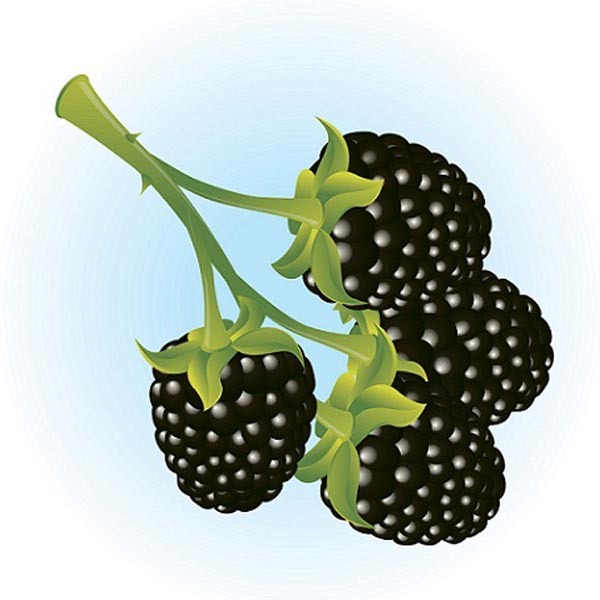 However, as it is clearly visible that these here have more a black touch to them and shading. If you want, you can have it in these colours or get it fully coloured depending on what you like or your sporting comfortability. Best Suitable For: These arrow designs are inspired by tribal art and are perfect for women. If you are looking for a girly style then you can choose something like this for your back. These often come in black colour. However, you can choose to have these not just as normal plain flowers but as a small coloured flower or similar other patterns for the back. These look quite cool and you can sport these with much ease. These can also be hidden with makeup since these are so small. Best Suitable For: This mandala art flower tattoo is suitable for women who are artistic and is one of the best small back tattoos. This looks more like a pencil drawing style and with just a border or outline, these types of styles can be done quite easily on your fingers and you can have thee on any other parts of the body too. It depends on your choice what you want to sport and you are comfortable with. Like you can do directions or waves, you can also do small water symbols like this one. This is a small pencil drawing style only border done ship sailing over the waves. This is a very girly and also boyish look. You can try similar styles and these can be done in small portions or rather very small portions so these can be easily covered with makeup. Best Suitable For: Best for women, who love the idea of sailing alone on the sea and enjoy the comfort of a solitude! This is another pencil drawing style only border done cat symbol. You can sport these styles if you want your design to be very small. These also give you the opportunity to hide these with makeup if these are very small. 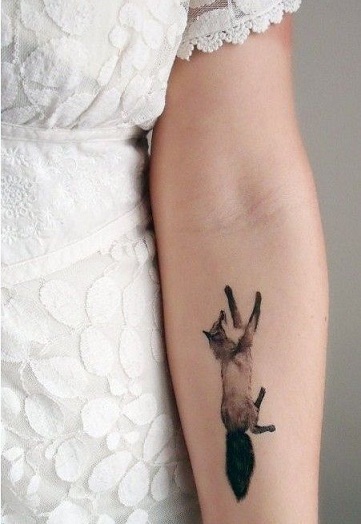 This small tattoo idea is the best for pet lovers. The small cat has drawn also gives a small tribal tattoo look. It is widely carried out by small girls going to school. The cats in this tattoo can also give different looks such as an angry cat, wild cat, clumsy cat etc, according to the mood of the wearer. 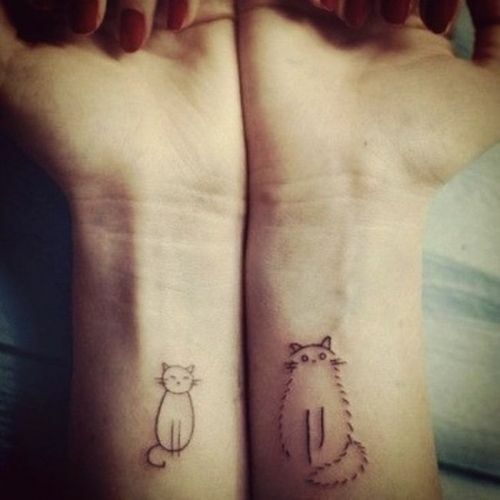 Best Suitable For: If you are a feline lover, these cute furry tattoos are just for you! Preferable Ink: Black is ideal! Where: Wrists are the perfect spots to declare your love for these adorable creatures! This is a winged design for the back. Though this is not very small, yet this is smaller than any other types of wings styles that you might have come across. This is very intricately done in black and you can add other colours to this. This unique winged tattoo is counted as a Royal Look Tattoo because of the symbols it carries. The two eagle wings symbolize power, dominance, and honour, while the horse in the middle stands for strength and guidance. 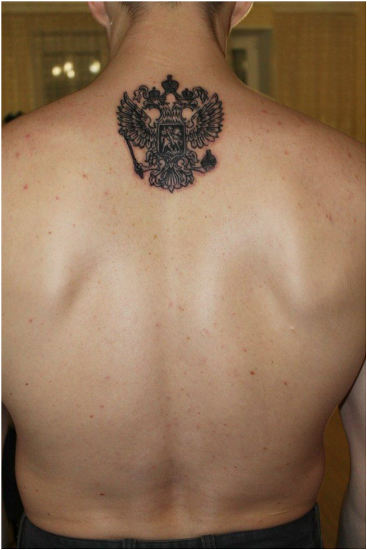 It is the best small neck tattoo for men, widely related to military, navy or are relating to proud of their nation. 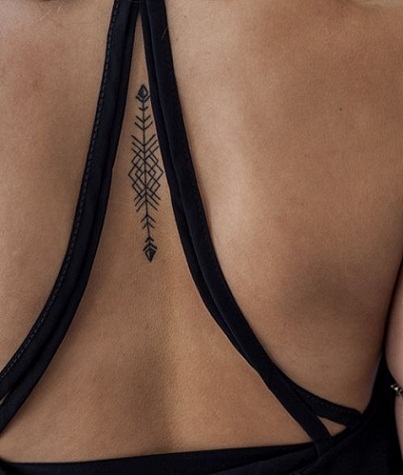 It is one of the popular small tattoo ideas for men on the back. Preferable Ink: Opt for a single colour like black! Preferable Ink: Black is beautiful! This is a colourful bird tattoo pattern that you can easily do for the feet. If you want you can keep these in black and white or you can do these in colours whichever you think suits your needs and your comfortability. These flying birds represent freedom, individuality and high-spiritedness! 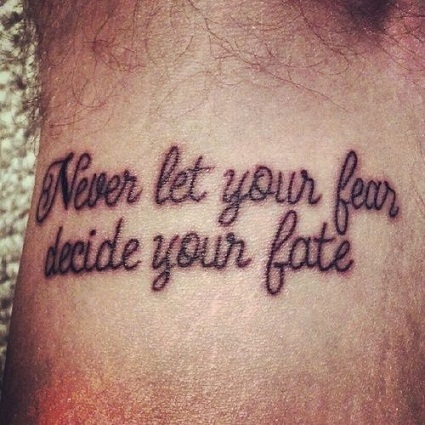 It is one of the small inspirational tattoos! Best Suitable For: If you are a free-willed woman, these lovely birds are right for you! You can decide on these types of designs before getting it done. You can also have these custom made to suit your needs. If you want, you can have it in black and white or get it fully coloured depending on what you like or your sporting comfortability. 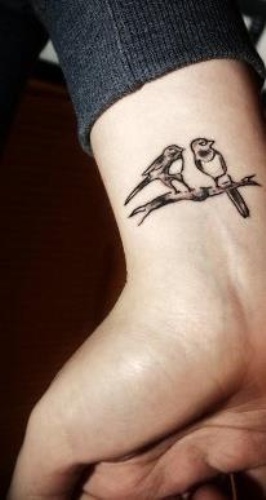 The two birds perched on a branch represent the bonding time of a family! Best Suitable For: If you are a man or woman who has a strong bonding with your family, this is the best design! Where: The wrist portion is perfect to display your love! This is a girly style and you can try these easily. These are small cupcakes and if you are a fan of cupcakes the try these out. Cupcakes serve as a desert and hence, this tattoo is highly carried out by small girls, which fills their life with sweetness. The small cupcakes when designed as above tend to be small rings in the fingers. They are followed with hearts above which shows their love for the cupcakes. Such cupcakes can be designed on the neck and lower back also. When filled with different colours, they give a delicious look. They are also cute small wrist tattoos. 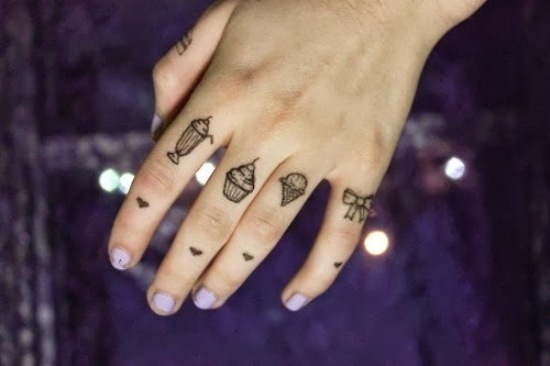 Best Suitable For: If you have a sweet tooth, these cute looking tattoos are right for you! These are one of the new-gen small tattoos for boys and girls! If you are looking to get something like this tattoo design then you can hide these easily since these are very small. This small tattoo quotes the mathematical as well as heart shape in a very unique manner. The heart is a symbol of love, while the mathematical infinity means forever. 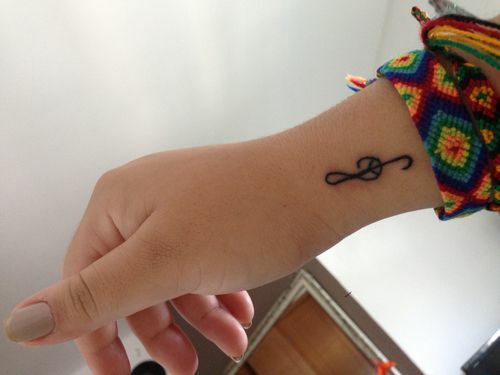 This small tattoo hence symbolizes infinite love for someone. 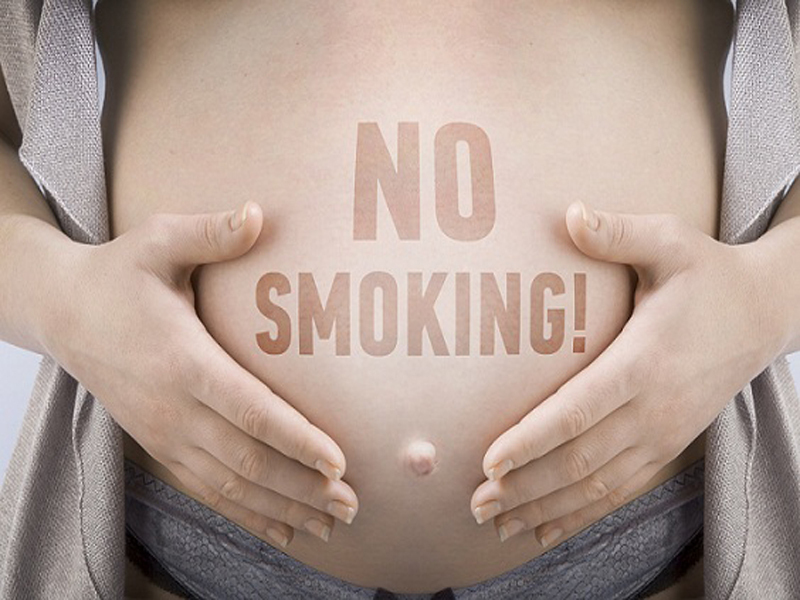 This tattoo is highly carried out by women on their hands, legs, waist, neck and shoulders. The design gives the best effect when made in 3 D way. This is also one of the small meaningful symbol tattoos. Best Suitable For: Go for it if you have endless love for someone! Suits both men and women! These types of small designer style tattoos can be custom made by your artist according to your needs. This hand small tattoo for men and women are quite trendy these days. 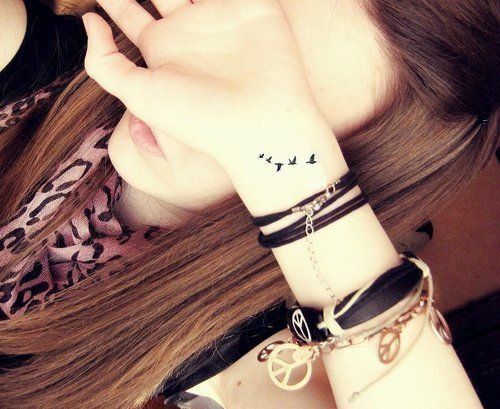 The people who love small designs opt for such tattoos with a birdie theme. Such small butterfly tattoos or flying birds indicate freedom to the sky and hence are carried by people who love to live in their own dreams and have a higher goal to achieve something different without any norms to be followed. This one of the meaningful small tattoo designs for ladies. Best Suitable For: This flying bird represents a person’s aim to soar new heights and is designed especially for women! A tree can be a symbol of prosperity and growth and it is also a symbol of shade or protection. 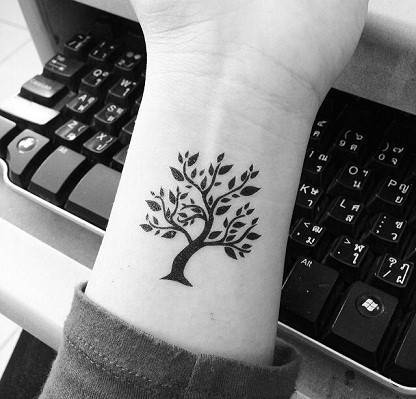 A tree tattoo not only looks very modern and stylish but it also has importance because it represents protection. This is one of the most beautiful small tattoos! Best Suitable For: Tree tattoos suit both men and women. It represents a new lease of life, shelter and protection to loved ones! Well, we all know that numerology is all about the planets and numbers and so is this tattoo design which would look great as one of the small tattoos for girls or as one of the best small tattoo designs anyone. 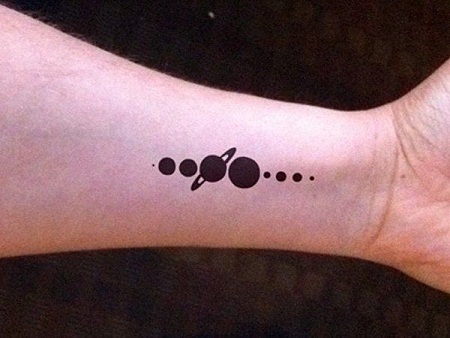 In this, you can get all the planets inked in a vertical row one after the other. It is better if you are fair because getting these planets in colourful forms can make them look even more beautiful. Best Suitable For: If you believe in the power of planetary positions, this unisex tattoo is perfect for you! This is basically a paper plane with an extension of maybe a wave or some font. This is a very fashionable design now and features well among the top designs of tattoos for men and also as one of the best small tattoos for women. This is a sign that you are still very fond of your childhood memories and how you used to make paper planes when you were very small. Best Suitable For: If you are a light-hearted person and can go along with the wind, this creative design is just for you! 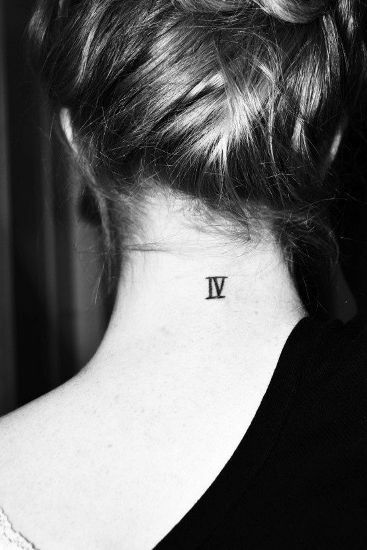 Preferable Ink: Keep it basic! Keep it in black! Foxes are animals which represent wit and wisdom and so is this design which is among some of the recent tattoo designs for men and small tattoo designs for women. If you think you are the witty one and can solve problems really quick there can be no better design than this one for you. This is one of the best small tattoo designs for arms. Best Suitable For: If you are clever, witty and also an ambitious person, this furry tailed fox is the best pick! Quotations which spread positive messages and good thoughts are always inspiring and keep you going even when you are low. Inking one of these positive quotations on your body serves as very good small tattoo designs for women and anyone else. You can also extend these quotes with a cross or maybe small waves or an angel or however you please to. Adding colours also sounds like a great idea here. You can even try small name tattoos in this pattern! These geometrical and symmetrical tattoo designs have been topping the charts for the most in demand for years now. 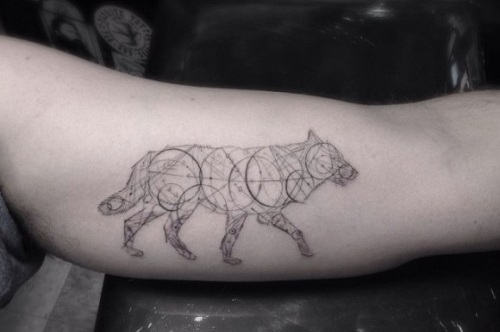 For the people who do not like much experimenting and are happy with their small tattoos may try some of the geometric tattoo patterns which are also some of the small tattoo designs mostly. You can even write short messages in the form of geometric line patterns. Best Suitable For: If you have a toned back area and have a love for symmetry in life, you can choose this design. Best for women! 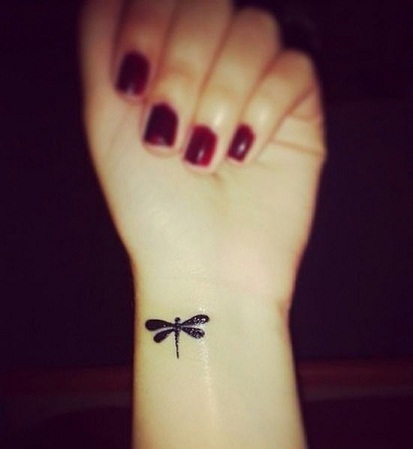 For the best of small tattoos for girls, a few small dragonflies on the neck sounds really sweet and stylish too. 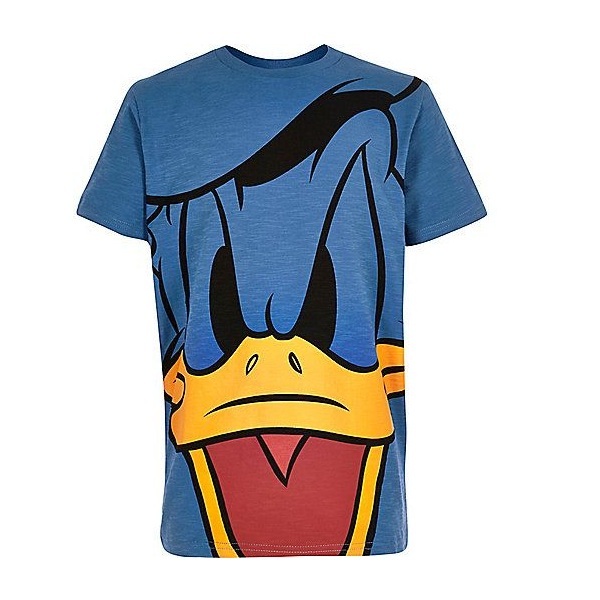 Adding colours to these designs can make them look even better and realistic. Dragonflies have always been in demand when it comes to girls coming for tattooing. There is some kind of hidden connection that girls have with dragonflies and besides dragonflies are symbols of freedom too. This is one of the small and simple tattoos. Hi! 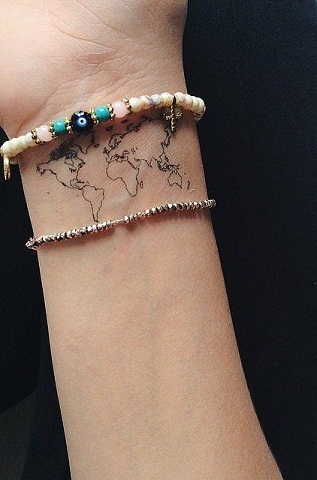 This is for the travel enthusiasts out there who want to travel the whole world and be a part of it all, a world map sounds like a great tattoo idea right? Not only is this design very uncommon but a very smart one too. This one has recently become a part of the list of small tattoos for men however these can also be done by women and young girls without any worry of looking bad. 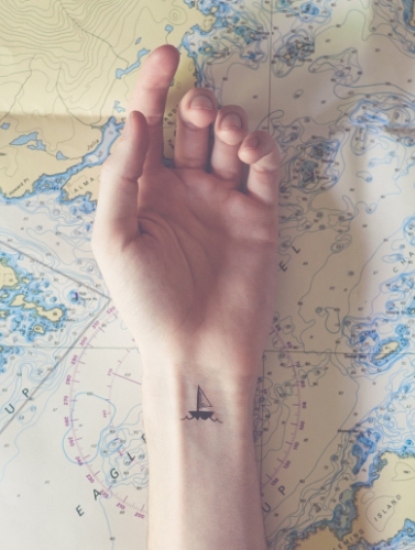 Best Suitable For: If you are a globe trotter, this world map tattoo is just right! Suitable for all genders! When you think that you are brave and you need to fear none then why not show the world what you believe. Ink quotes which speak bravery in different kinds of fonts and you can also use colours. This one looks like a very suitable among all the small tattoo designs for men who are fearless and love to take the path not chosen as yet. 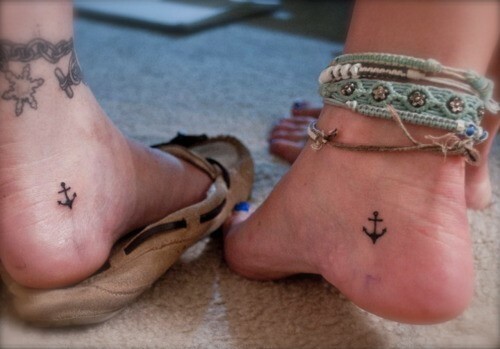 They are the most preferred small meaningful tattoos for guys and girls! Best Suitable For: Suitable for both men and women, who wish to keep telling themselves to shed their fears! 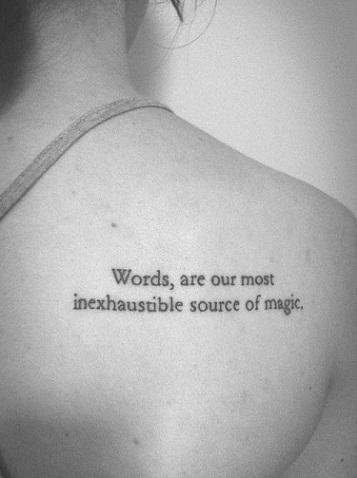 Preferable Ink: A basic black ink would do! Where: The wrist area is perfect! 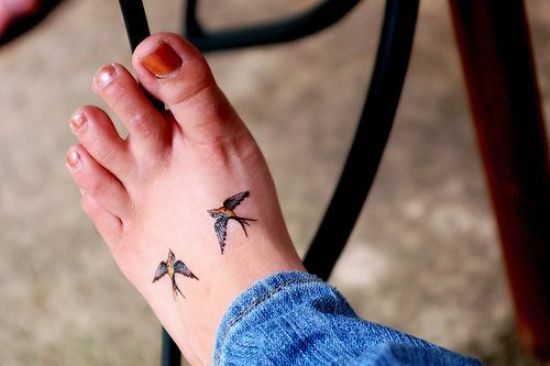 You can get little birds tattooed or maybe some feather design but how about getting a combo of the both of these even if you are to choose from the best small tattoo designs for women. You can get tiny birds and a colourful feather inked anywhere from your neck to one side of your back and then flaunt it wearing your cute tank top. These are such that you can even hide them when you wish to because they are so small. Best Suitable For: These Native American tribal tattoos are suitable for women. You can make them look masculine by increasing the size! Preferable Ink: Go for black with hints of brown! Where: Creativity is the limit when it comes to feather tattoos! It is beautiful to take a dandelion in hand and then blow it away to see it finish completely. Why not capture the moment on your skin and feel like you have stopped time for yourself. 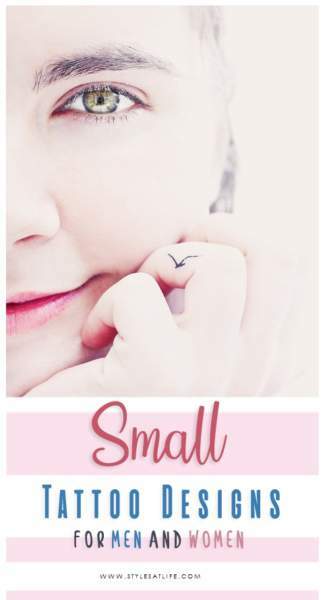 This seems to be one of the stylish small tattoos for girls and will look smart on any young girl or woman who wants to keep it safe yet stylish. 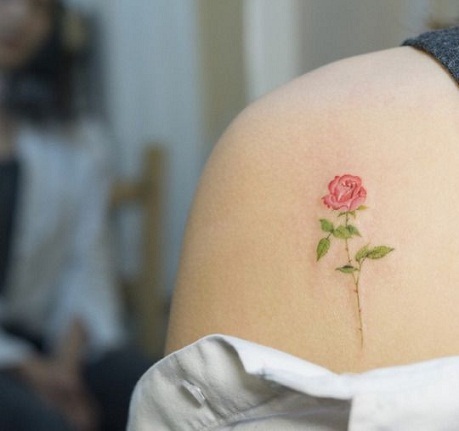 It is one of the best small flower tattoos for girls. 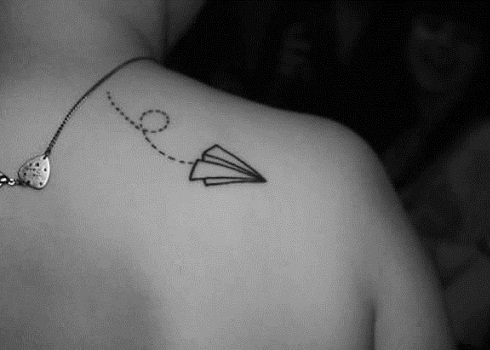 Best Suitable For: One of the best small tattoo ideas for women who can kick start a new phase of life wherever destiny takes them to! Best Suitable For: This cute red rose is specially designed for women, who to the world appear to have a rosy life despite all the struggles (thorns) in their life. It is the most widely opted small colourful tattoos. When you want to keep it very simple yet very stylish, a penguin design maybe at the side of your neck will look really very pretty and is also one of the most fashionable small tattoos for girls. 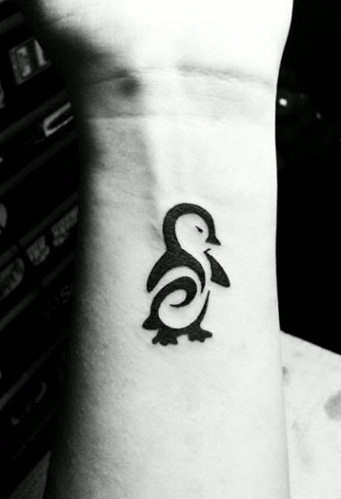 Penguins are a symbol of peace and rarity and so should be your tattoo. Also, it is so small that you can hide it anytime with your hair or with makeup. 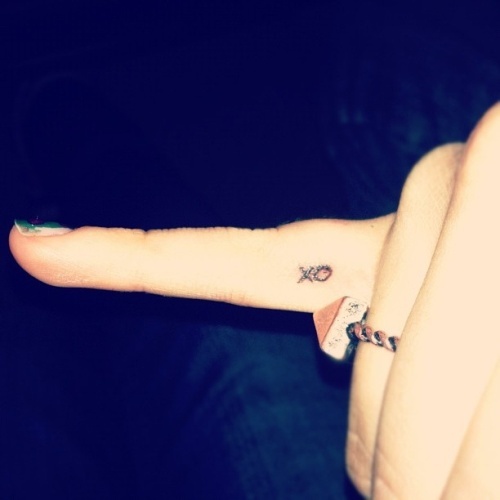 This is one of the cutest small symbolic tattoos. Best Suitable For: Penguin tattoos are generally designed for women, who is lovable and adorable! Preferable Ink: Like the basic colour of the penguin, opt for a black ink! Where: Wrist area is an ideal spot! 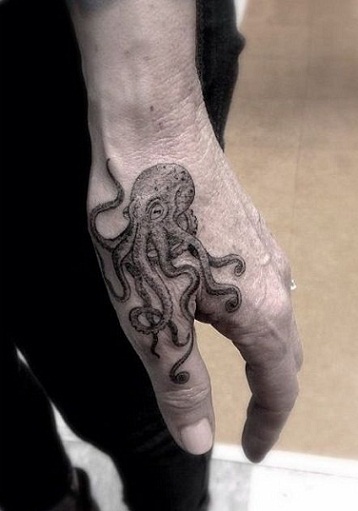 Oh, that cute octopus on the back of your hand! It looks so pretty. It is an octopus which seems to be such a unique design and is a great option for small tattoo designs for men as well as women also. You can also add bright colors to this octopus and make it look even better. A small design as this one can be hidden by your hair or hand anytime. This is also one of the best small tattoos for men! Best Suitable For: An octopus is a bright and intelligent creature, which can adapt to its surroundings quickly. Suits both men and women! While roses are very common among all women and girls what is overpowering these common designs are small images and designs of the lotus flowers. You can get one inked on your wrist and then flaunt it is style. 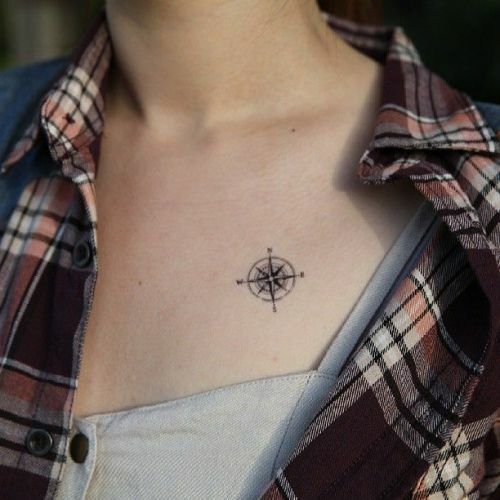 This is a great option as one of the small tattoos for girls and can be done easily. This is one of the elegant small pattern tattoos for girls on hand. 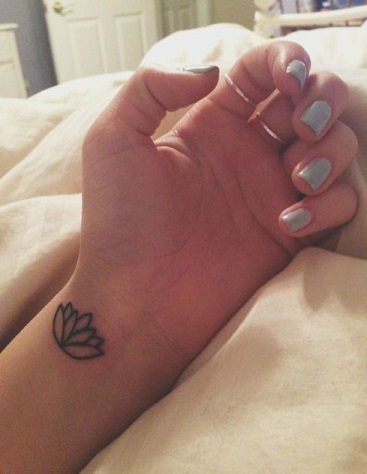 Best Suitable For: This beautiful lotus tattoo symbolizes purity and innocence. Perfect for women and girls! Preferable Ink: Get it done with black! OM symbol now is just not confined to Hindus but it is common with foreigners too. 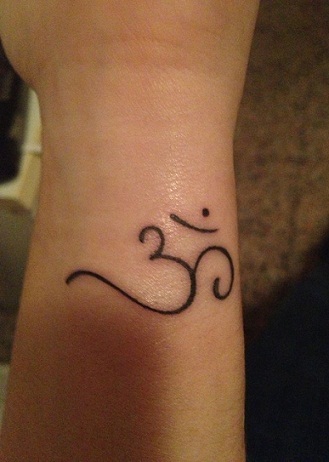 It is a very common symbol and sound which is used for any sort of yoga therapy or meditation and so people would love to get one inked as a symbol of peace and holiness on the body. This can be a great part of the list of small tattoos for men. Best Suitable For: Om tattoo is for both men and women, who understand the divine expression of this motif! Small tattoo designs are suitable for those who have no intention of getting permanent ink on their bodies, yet wish to try their hand at them! If you wish to hide the tattoo temporarily, you can dab a little concealer on it. 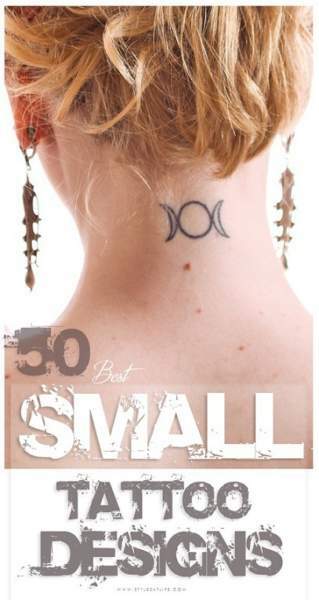 We hope you loved this collection of best small tattoos in the world and inspired you to try one of them! Not only do they look cute, but have a wallop of meaning associated with them. Small tattoo designs are the latest trend with the younger generation, who can’t stick to a decision firmly. In future, if they wish to reconsider their choice, it becomes quite easy with small tattoos. So folks! 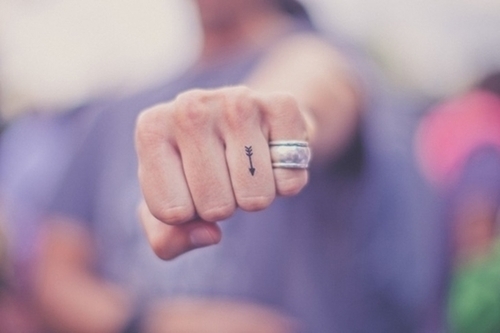 They might look small, but remember, small is the new mighty when it comes to tattoos! Do let us know which one is your favourite among them. Love this site it’s amazing!!! It helped me design the tattoo that I wanted. I love they way they explained symbols. Thanku for this lovely post…..i really love them all tattoo designs are so adorable and so unique. I would definitely try this out…Looking forward for such interesting posts….